The Save & Finish Later feature lets your users save a partial form submission and return to it at a later date to complete it. This is especially helpful for lengthy forms, or forms that require information that the user might not have readily available. After you enable this on your form, you must add a Button or Link, element to your form, and configure an action on that element that gives the user the option to save their progress. Without completing this step, there will be no visible option on your form to allow your users to save their progress. The Credit Card Number field is NOT repopulated when a user saves and later resumes a session. If you are using a multipage form, we recommend you place any credit card fields on the last page of the form to ensure that page is always visited/shown to the user prior to submission. In the Finish Later Configuration window, you have two tabs. Status Check to enable the Save & Finish Later functionality; deselect to remove the functionality. If you disable this option after it has been enabled, you will delete any pending/partial submissions. Check this box to record partially completed entries; the finishlaterflag field value for these records will be "userOptstoFinishLater". When you enable this feature, your autoresponders and notifications will be initiated at the time of submission. To avoid sending an incorrect response, you would need to create a rule that inspects the value of the finishlaterflag field and then decide whether to send any notifications. You can check the finishlaterflag field for the value 'userOptstoFinishLater' to ensure the correct response is sent when the user pauses a submission vs. completes a submission. You can use the wildcard [finishlater_resumeurl] in an autoresponder to provide the URL to the user. The easiest and most commonly used option is to set Always Prompt to Enabled. This way, the prompt to resume a paused submission is shown to each person who sees your form. If they do not have a paused submission, they can click the option to start a new submission. If you decide to disable the Always Prompt feature, you'll need to provide the user with two links to your form: one to fill out the first time and another link for them to return to finish the form (with ?loadfinishlater=true appended to the URL). You could include two links on your website, for example, "Click here to start a new submission or click here to resume a previously paused submission". Another method is to include a link in an autoresponder email prompting the user to return and complete a paused submission. In that case you would include ?loadfinishlater=true at the end of the URL so that the prompt to load a paused submission is shown when the form is loaded. You would also need to have record partial entries set to true in order to enable the autoResponder email to be sent at the time the submission is paused. 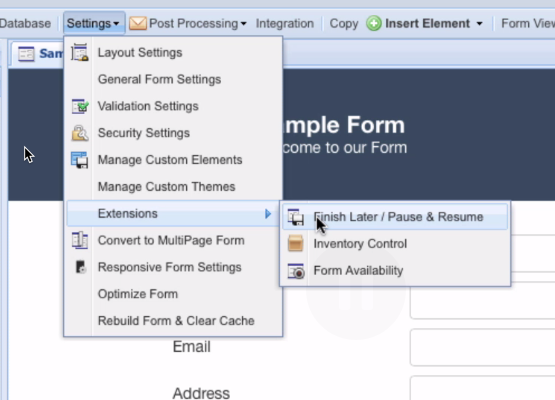 Resume Last Page For multi-page forms, check this box to have the user resume on the page they were viewing when they invoked the Finish Later feature. When the Unique ID Only checkbox is checked the user will not be asked to enter a username and password to save and retrieve data, instead they will be given a direct URL to return and resume their paused submission without the need to login. This is done via the use of a unique ID appended to the URL. Also note, when this option is enabled, the Always Prompt option is not applicable and the only way to resume a paused submission is via the URL provided. This is the message the user will see above the URL provided to them to return to their incomplete form -- if Record Partial Entries is not enabled. Custom Return URL If your form is embedded on your website, this is the URL to the page that it is embedded on. If you are not using embedded integration, then leave this field blank. Upgrading to "Direct Link to Resume"
The Direct Link to Resume option was added June 10th 2013. If you have an existing form already configured with the Save & Finish Later extension, and want to move to the Direct Link to Resume mode, please follow the steps below. Also note that any existing paused submissions using the username and password mode will no longer be able to be retrieved by the end user. It is not recommended to switch between the two modes when in production. 3. In the Form Designer, click Save. 4. From the Settings menu, choose Rebuild form and Clear cache.